SoBo’s newest resto-bar, Vortex South, opens at Marine Drive and it will offer modern fusion vegetarian food along with delicious drinks. With a menu that offers vegetarian cuisine with a modern and progressive outlook, and keeping the international flavours in mind, Vortex South is the newest SOBo destination for an evening with amazing and palatable food, fancy and unique drinks to pair it up with and amazing music to keep you groovy. The interiors of the place are crisp and sober, Vortex South is inspired by the theory that everything in the universe is connected to everything else. Look forward to Cellulo-Organic designs and shapes, with contemporary colors, materials and textures, and warm light sculptors, along with a friendly and stylishly laid-back ambiance. The food menu at Vortex South is vast. The must try special dishes here, we’re told, are the Dutchy burger with maple cream cheese, Kremushroom with cream, cheese and fennel, kung pao silky tofu, lemon grass tofu, butter garlic rice, and much more. The food will be simple yet unique, matching international standard with its flavours and presentation. The bar here has a special section of vodka on the rocks called infusions on the rocks. The alcohol here is infused with different fruits and spices like apple, grape, plum, orange, lime, cucumber, pepper, star anise, other spices, etc. They also have roasted cocktails where all the ingredient of the cocktail are roasted and added to the alcohol giving it a roasted and smoky feel. 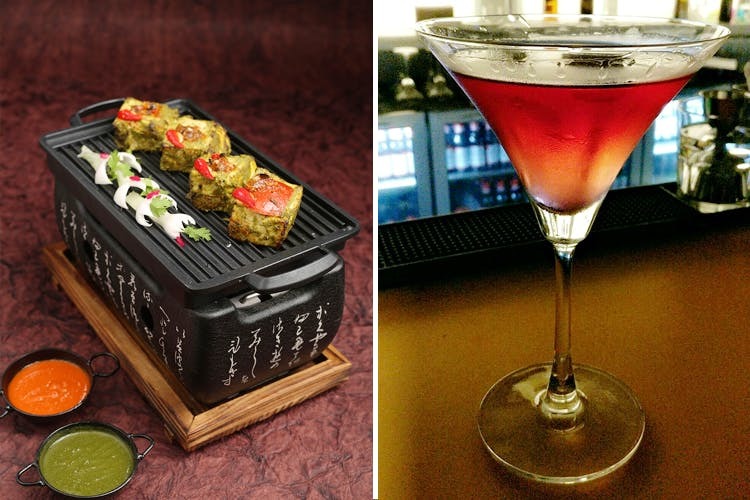 Along with that, they have a variety of martinis, LIITs, mocktails and an entire spread of healthy mocktails too. The must-try drinks are the pom-pom martini, apple and rosemary martini, chocolate martini, vodka infused with plum and grape on the rocks, black martini with pepper, healthy mocktails like lava flow, iced green tea and roasted cocktails like roasted colada, roasted watermelon and basil martini, etc. Head to Vortex South where you can gorge on unique vegetarian food while sipping on equally unique drinks while sitting at beautiful Marinde Drive.